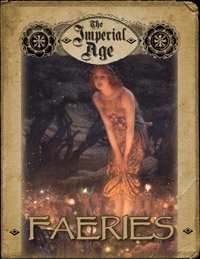 The Imperial Age: Faeries offers Gamemasters and Players one of the most comprehensive supplements on Faeries ever released, applicable not only to Victorian-era d20 campaigns, but any game looking for a taste of the otherworldly realm. Chapter One, On Being Fey, presents an introduction to the use of Faerie in an Imperial Age campaign, and a half-dozen Victorian theories as to the nature and origins of Faeries. Chapter Two, Becoming Fey, provides an exhaustive collection of all manner of races, sizes and types of Faerie, presented as playable races for PCs or NPCs. Chapter Three, Fey Touched, includes rules for the mingling of Faerie and Human blood, providing new Talent Trees, Feats, and Starting Occupations. Also included is the Changeling racial advanced class, by which a human character may develop into one of fey blood. Chapter Four, Fey Foes, presents several templates that can be used to create creatures from the realm of Faerie, as well as several new monsters and a collection of Faerie NPCs. In “The Fair Empire”, the veil between our world and the Otherworld was first pierced in 1599 — it is now the late 19th century, and the Immortal Queen Victoria Glorianna, ruler of England, Wales, Ireland, America, Canada, Australia, India, the Summer Lands and rightful queen of Scotland, sits on the High Throne of the Endless English Empire. “The Fair Lands” is more than just a single campaign setting, as it can be used in any campaign. It details the Faerie Realm — taking ordinary PCs and casts them into a world of magick and danger where they might struggle to save or rule a kingdom, recover ancient treasures, or simply get back home. Lastly, “Fair Folk” presents a world like our own, but where a select group of officers of the Metropolitan Police have been quietly investigating reports of Faerie activity, simultaneously trying to protect the Empire, uncover the truth, and keep the public from panic.